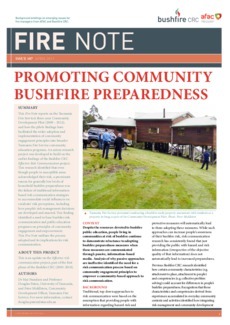 This Fire Note reports on the Tasmania Fire Service’s three-year Community Development Pilot (2009 – 2012), and how the pilot’s findings have facilitated the wider adoption and implementation of community engagement principles into broader Tasmania Fire Service community education programs. An action research project was developed to build on the earlier findings of the Bushfire CRC Effective Risk Communication project. This research identified that even though people in susceptible areas acknowledged their risk, a prominent reason for generally low levels of household bushfire preparedness was the failure of traditional informationbased risk communication strategies to accommodate social influences on residents’ risk perceptions, including how people’s risk management decisions are developed and enacted. This finding identified a need to base bushfire risk communication and public education programs on principles of community engagement and empowerment. This Fire Note outlines the process adopted and its implications for risk communication.